The partnership between LEO Learning and RWS utilises the power of gomo’s authoring tool – deploying its cloud-based rapid content translation and distribution abilities. Creating global content that is both translated well and localised can be a major headache. This service is designed to remove the pain and increase the speed and quality at the same time. 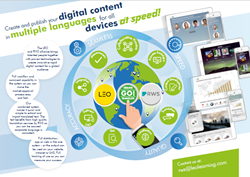 LEO Learning, global leaders in learning content and technologies, and RWS, translation and localisation experts, have joined forces to launch a complete content and translation solution for organisations seeking to deliver high-quality content in multiple languages. Leveraging the power of cloud-based, fully responsive authoring tool gomo, the integrated service allows organisations to quickly create and publish high-quality digital content in multiple languages for all devices. The solution builds on ten years of innovation between LEO and RWS, whose translators and learning experts support hundreds of organisations to meet their global learning and communications goals. Recognising the value of combining highly skilled teams with world-leading technology, the partners launch this solution to reduce the time and complexity associated with developing multilingual digital content, while increasing quality and engagement. For one global automotive brand, this solution facilitated the creation and launch of a learning programme, published in 11 languages and rolled out to more than 32,000 employees in just six weeks. Thanks to the power of gomo’s cloud-based technology, content can be created and reviewed in real time by all collaborators, swiftly imported and exported for translation, published with automatic responsiveness on all devices, and downloaded for offline consumption. Courses can be distributed via an app, website, Intranet or LMS, with L&D teams able to fully track learning outcomes. “For global businesses, localised content is key for successful communications. We are pleased to be partnering with LEO to not only make digital content globally accessible, but to reduce the time it takes corporates to get their content to market by leveraging our collective expertise and gomo’s cloud-based technology,” said Stuart Carter, Managing Director for RWS Language Solutions. For more information, please contact rws@leolearning.com. As 2017 Learning Technologies Company of the Year, LEO Learning has the deep understanding of learning design and technology, and pioneering creative approach, necessary to drive the learning revolution. LEO Learning’s expanding global customer base includes organisations such as the NHS, Civil Service Learning, Jaguar Land Rover, Volvo, Virgin Atlantic, Novartis, Godiva, Volkswagen, Dunhill, Roche, Sainsbury’s and Mars. RWS is the world leader in translation, intellectual property support solutions and life sciences language services. Over the last 60 years, the company has built a reputation for quality, reliability and flexibility with its global team of in-house translators, searchers and technical experts. RWS’s specialist divisions work together to deliver complex services at each stage of the product lifecycle to meet the diverse needs of a global, blue chip client base spanning Europe, North America and Asia. RWS’s translation and interpreting services are delivered in accordance with ISO9001 and ISO 17100 and are trusted by companies across a range of sectors. RWS combines the latest technology, proven processes and the best linguists to deliver the right solution to meet the different needs of each organisation. RWS has 22 offices worldwide and is listed on AIM, the London Stock Exchange regulated market. Since gomo’s launch in 2014, its hassle-free, multi-device learning suite has won multiple awards including two Brandon Hall awards for the Best Advance in Content Authoring Technology. gomo Learning was named the #1 authoring tool in the world in 2016 by industry expert Craig Weiss and, in 2017, gomo Learning featured on Training Industry’s list of ‘Top 20 Authoring Tools as well as being named ‘Core Leader’ on Fosway Group’s 9-Grid™ authoring system report. gomo’s global customer base includes organisations such as Jaguar Land Rover, L’Oreal, EE, British Airways, O2, Rentokil Initial, Santander, Boots and Deloitte.